There's so much to love about October - the leaves start to render their colorful coat, the air is fresh and crisp and the warm sunlight casts a perfect glow. It's my favorite time of year for running - most days are warm enough for shorts and a tee shirt but cool enough to be perfectly comfortable while crunching through the leaves. We were spoiled this October. It's been dry and warm. I've got a group of friends to share my Saturday long runs with, and I've convinced several others to run with me in the dark during the weekdays. Distance: 135 miles - my biggest monthly run volume of the year, just shy of my 2014 max. I didn't train for a fall race, but my running friends were training for the Indianapolis Monumental Marathon, so most of my Saturday runs were in the 15-17 mile range. I had deferred my entry to the Chicago Marathon, felt (slight) twinges of remorse as I tracked my friends running on race day. My goal is to run it in 2016 with a bunch of friends in tow. I just need to convince them to sign up! Running isn't forced. You have to relax and let the run come out of you. 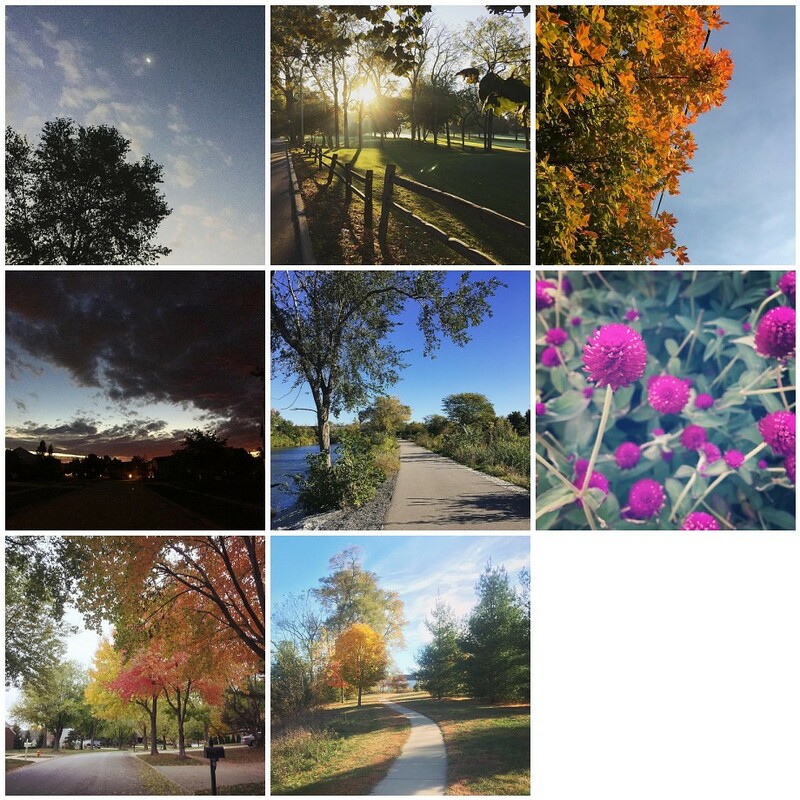 A great collage of shots, Shirley! Love all of these photos! 135 is really serious mileage, especially considering you weren't training! Also nice that you have friends to run with on the dark weekday mornings. I wish I did!